Download Packet Tracer 7.0 for free today and start practicing networking. Many network engineers have come along way, reading eBooks, listening to audio tapes and watching several videos on networking, but it amaze me so much when they all lay emphasize on live configurations. 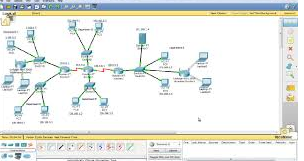 As for me the cisco packet tracer is a one stop for every good network admin, maybe your yet know, but, when you know your packet tracer, employ and explore the concepts, your journey to the top as a network expert becomes so easy. Meanwhile there some basic approach that we at phfreetech has outline for everyone who wants to be successful in their networking carrier. The desire : In networking it is important for the person involved to be so desired to take up the tasks, go sleepless night and sit on your computer for hour, instead of you going around talking about technology and all of that,you sit down and create one for the world to see,so desiring for more time along is very necessary if you wants to obtain a good result as a network person. Giving it attention : people loose good things as soon they loose focus, paying so much attention is very important as network person, focusing on what your doing whether your getting result or not, knowing too well that your a solution to someone somewhere, lay a task for your self, create scenarios, think of how to solve them and then ask yourself what are mine doing ? how does these commands and configurations affect my life, family and relationship, at this point people will want to help you but you will found that you the one helping them in turn by solving tough problems. Making friends : There is a quote that says that birds of the same feather flock together, with this I see it as an important role for you as a network person to choose your friends appropriately so that your conversation will be narrow down to the ideas, it is therefore expected that our peer group contributes to our daily knowledge. schedule meetings with friends, and choose a convenient place for practical at least once in week with each person discussing on his challenges and how he was able to solve them. The moments : In networking there is always what i call the moment, this is that moment you have to decide weather to continue your networking carrier, because at this point your family is so much demanding for your time and maybe a little bit complaining and your seeing yourself as not giving them attention, at this time your have to make a decision on how to schedule your activities to create time for your family, also, not forgetting that networking is a daily thing. Strategies : Every successful person had a strategy, so is a network person also, one can start by downloading simple questions, or gradually increasing the time you spend on your computer system than the one you spend idling around. At this time you ask yourself at what time do I find it more convenient practicing my Carrier, is it in the morning, when am so fresh and relaxed, or in the evening after a hectic day so i can spend all night studying my cisco command and protocols. Tips : The tips on becoming a good network person is starting from a small network orientation and them growing gradually to an enterprise network, we don’t expect you to master all the entire command and configuration on cisco packet tracer on a day but definitely one day your story will be shared among us, finally consistence makes the job look so simple even though it is not, I will want to recall that a day without practicing at this beginning level may also be a draw back to you. But in all the best way to learn networking is just by practicing and doing it daily and not occasional.